Skin Vitality Medical Clinic is the TOP provider of Juvéderm in Toronto, Mississauga and in fact, the whole country. We perform more Juvéderm dermal filler injections than any other medical practitioners in Canada. That includes all the doctors and nurses across the country! The filler we offer at Skin Vitality Medical Clinic is an FDA and Health Canada approved “next-generation” dermal filler that is based on hyaluronic acid, a naturally occurring substance in your skin. A single treatment can provide a subtle to dramatic improvement of your appearance without surgery. If you’re interested in reversing the effects of aging, improving your appearance and feeling better about yourself, consider Juvéderm injectable filler. All patients must undergo our medical consultation with one of our licensed physicians prior to receiving dermal filler, which is a prescription medication. During your free consultation, you’ll spend some time talking with one of our physicians as well as one of Skin Vitality’s Registered Nurses to determine if this is right for you. This complimentary consultation allows you to learn more about the filler and get expert advice on how to truly achieve the improvement you want through this non-surgical treatment. Juvéderm® is so commonly used that it’s easy to assume that anyone is suitable. This isn’t always the case, though, and people considering the injectable for their aesthetic goals should familiarize themselves with what makes for a good or bad candidate before planning their procedure. Juvéderm® is mainly used for “filling out” facial wrinkles and folds, removing smile lines, and smoothing out the presence of scars or pockmarks for a more youthful appearance. It’s also able to provide patients with plumper or fuller lips, something that patients find a concern particularly in their latter years due to decreasing collagen and elastin levels. The primary ingredient of Juvéderm® injectable filler is hyaluronic acid, a substance that loves water, which is perfect because your skin is made up of about 70% water! An injection of Juvéderm® into the problem areas on your face introduces fresh HA into your skin. Once injected, HA molecules bind with the naturally present water in your skin and each swells substantially. To give you a general idea of how much it can swell, one molecule can absorb over 1,000 times its weight in water. This swelling is what plumps up your skin to fill out those unwanted wrinkles, creases and noticeable hollows. This same effect is what also helps to modify facial contours that you want reshaped or more defined, such as your cheeks, nose, jawline, or chin. Another great effect of a Juvéderm® injection is that it improves the overall moisture levels in your skin, something that older patients can definitely appreciate. Higher moisture levels means that your complexion will look more vibrant and healthier as well. For aging, the goal of our injectors is to simply replace the amount of HA in your skin that has been lost with every passing year. For facial contouring to reshape your original features, whether you’re younger or older, Juvéderm® simply adds more HA to your skin to add the volume necessary to make a positive change. Hyaluronic acid (otherwise called hyaluronan or hyaluronate) is a naturally occurring property of the human body known as a glycosaminoglycan. It can be found throughout the average person in skin, cartilage, muscles and tendons; a 150 pound individual has approximately 15 grams of hyaluronic acid in their body that is constantly in use by natural processes. Because it is found throughout the body, hyaluronic acid has long been of interest to cosmetic medical doctors. In the 1970s and ’80s, it was first developed into a biomedical product that was used for various eyes surgeries (including glaucoma and cataract surgeries, corneal transplants and more) and is still, to the present day, researched and incorporated into drugs for medical use. In a similar manner to its medical uses, hyaluronic acid is also appropriate for skincare products and is commonly found in them. Hyaluronic acid is an essential component that forms the healthy structure of our skin. When we’re young, HA levels in our skin are relatively high, which is one reason why our skin is supple and elastic. However, with age and exposure to the damaging elements of our environment (particularly UV rays from the sun), our body produces less and less hyaluronic acid. The amount of HA in our skin disintegrates, and combined with a decrease in collagen and elastin fibres, the most notable signs of aging develop: wrinkles and volume loss. The American FDA granted approval to the hyaluronan injections in 2003 and physicians then began using hyaluronic acid for filling soft tissues to remedy aesthetic problems such as wrinkles. Juvéderm® uses hyaluronan to address wrinkles, facial contours, enhance the size and shape of the lips and can even smooth our scars and indentations. Juvéderm® can restore fats and elasticity that is lost, not just in skin, but also in lip tissue. Which Juvéderm® dermal filler do you want? Most people are familiar with Juvéderm® itself but aren’t aware that more than one type of the product exists. Each of the various Juvéderm series work on the same principle — introducing hyaluronic acid into the skin so lost collagen and natural fats can be replaced and rebuilt — but different types of the substance can be used in order to meet a patient’s specific skin improvement desires. The two most popular are Juvéderm Voluma and Juvéderm Ultra. Deciding on the type of Juvéderm necessary for an effective treatment of your skin problems is a combination of personal preference and professional advice. Everyone’s goals are different and the kind of results desired from Juvéderm® procedures will make up the biggest factor in deciding on the right product. As a general rule, however, Ultra is often the correct choice for patients that only wish to address localized skin problems (like small areas where wrinkles and fine lines are present). Voluma is usually the better option for patients who desire a more immediately noticeable difference in appearance. Speak to your medical injector for more advice on the Juvéderm treatment that’s right for you. They’re able to leverage your preferences and goals with a professional knowledge of the entire family of Juvéderm products. Voluma is geared toward patients that wish to achieve a large-scale increase in facial volume. It is best used for skin improvement goals that are concerned with restoring and recontouring (rather than eliminating wrinkles or lining). Voluma is capable of restoring lost volume to areas of the face (like cheeks and chin) that have become thinner or hollow-looking due to aging or weight loss. The effects of Voluma are longer-lasting than many other fillers as well. Research has shown that Voluma patients can expect their treatment results to last for as long as 18 months — a far larger amount of time than most other options. If you have serious volume loss and your skin is marked by sagging, Volift may be right for you. Enhanced with lidocaine for a more comfortable injection, this product gently lifts sagging contours. Consider it a facelift, without surgery! 3. What is Juvéderm Ultra? Juvéderm Ultra and Juvéderm Ultra Plus provide excellent results for patients that want to reduce the appearance of wrinkles and fine lines that have developed in the sensitive skin around the eyes, mouth and nose. It is also known as a more comfortable filler when compared with other, similar injectables on the market — something that makes Ultra a smart choice for patients that wish to have more extensive skin improvements performed and are most concerned about encountering discomfort during multiple treatment. Ultra is often recommended for its reliability in creating softer, more natural looking results than other fillers as well. 4. What is Juvéderm Volite? Although Juvéderm Volite is based on hyaluronic acid like the other products in the family, it doesn’t plump up your contours like them. Rather, it is injected into the middle layers of your skin at several points to achieve an overall improvement in the health and quality of your complexion. With results that can last up to 9 months, you’ll experience dramatic skin conditioning that makes your skin radiant and more supple. More hydrated skin to smooth away fine lines and rough textures. More elastic skin that’s smoother and softer because it boosts collagen production. More radiant skin because it’s more nourished from the inside out. The ideal Juvéderm patient is an adult who is in good physical and mental health and has realistic expectations for what the product can accomplish. Juvéderm is meant for treating moderate or severe wrinkles and folds on the skin of the face for natural facial rejuvenation. It also provides excellent results in facial contour reshaping and lip augmentation. This product has been medically researched at length on patients of varying skin types and skin shades. Studies prove that Juvéderm® is safe and effective whatever type or shade of skin you have. However, if you have particularly sensitive skin, the extent of bruising and swelling may be a little more and last a little longer. Typical treatments involve targeting the lower third of the face (where problems like smile lines and/or nasolabial folds are present). If your skin improvement goals include reduction or elimination of crow’s feet, brow line and eyebrow area lining or treatment for nasolabial (between the mouth’s corners and nose) or nasogenian (between the cheeks and nose) folds then Juvéderm® may be right for you as well. This filler may also be administered in conjunction with other anti-aging injections. A good patient should be financially stable (being comfortable enough to pay for Juvéderm® treatments) and willing to undergo ongoing sessions in order to maintain their appearance. Since Juvederm® is composed of natural ingredients, it absorbs back into the body over time (usually a period of several months to over a year) and must be reapplied in order to stay visible. An ideal candidate understands the need for this and isn’t put off by returning to their clinic for annual, recurring injections to maintain ideal results, however you may experience the need for less treatments. There are a few physical elements that can disqualify an individual from being an ideal Juvederm candidate. Having a history of extensive, problematic bleeding or bruising can make you a non-ideal patient. Juvéderm® isn’t intended for pregnant or nursing women, people on immunosuppressive medication (or medications that can aggravate bleeding or bruising) or who suffer from multiple, severe drug allergies. It is recommended that you avoid medications with aspirin prior to treatment, since it can increase the risk of bleeding. Unreasonable expectations and impatience also make for a non-ideal candidate. While Juvéderm® is known to provide fantastic results, they aren’t permanent. As mentioned above, injections should be performed routinely in order to maintain its desired effects. Juvéderm® patients also cannot be unwilling to handle the possible appearance of temporary side-effects like swelling, tenderness, itching or redness at the injection site. These side-effects usually only last a few days but can cause distress to candidates that don’t consider fillers benefits to balance the chance of minor skin irritations. One of the most popular products used in the field of aesthetic medicine is Juvéderm®. It is an injectable gel facial filler that is able to give patients the benefits of improved skin and anti-aging effects but they differ in several important ways. Once our doctor has deemed the treatment to be safe for you, you’ll meet with one of our expert medical injectors. They’ll examine your facial structure and skin quality. They’ll also talk to you about your goals and expectations of your treatment. This can take several minutes. 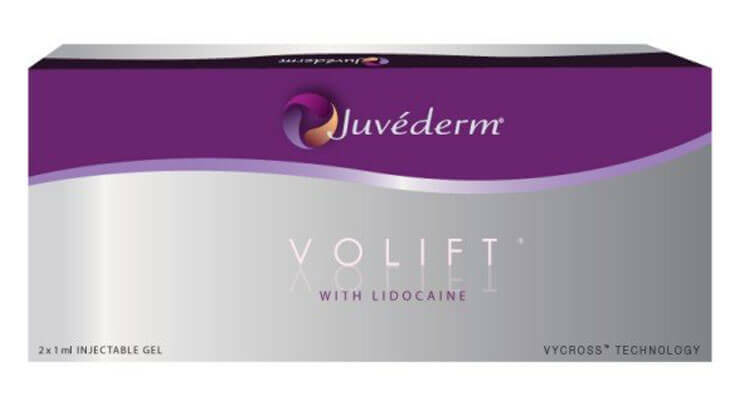 A topical numbing cream for local anesthetic may be applied to increase your comfort, however this isn’t necessary because Juvéderm® already has something in it to help you: lidocaine. Lidocaine provides temporary numbing of the treated area at the time of your injection, making any additional anesthesia unnecessary. The areas to be treated will be marked. Then, a series of Juvéderm injections are made in the area(s). A sterile syringe and fine needle that has been pre-packaged by the manufacturer is used. One or more syringes can be administered in a single treatment. Once injected, your injector may or may not massage the areas lightly to adjust the placement of the product. It’s important to note that you shouldn’t do this yourself at home, even if you see any lumps or bumps that are taking away from your desired results. You’ll be able to have any results you don’t like fixed at about two weeks after your treatment. By that time, the initial swelling should be gone, making it easier to deal with irregular contours. Juvéderm® procedures aren’t complicated or risky but patients — especially first-time patients — should know what to expect when they’re preparing for their treatment. It’s easier to go into your treatment with confidence (and without any anxiety) if you understand just how easy recovery is and exactly what it consists of. After you’ve completed your treatment, you’ll be free to leave and either return to your normal schedule or go home to wait out a quick recovery. You will be advised that strenuous exercise, alcohol consumption and excessive heat or sun exposure be avoided for a full day following the procedure. It’s also recommended not to touch, rub or massage the treatment site when possible in order to let the body recover from the injection as quickly as possible. Do not to massage or rub the treated area and be especially gentle with it for 24 hours after your treatment. You’ll be informed about which topical products to avoid (make-up, lotions, etc.) and the length of time necessary. In most cases patients are only asked to stop using these products for a short period of time (one or two days) but it’s important to ask in order to avoid any potential complications that can arise. As very small needles are used, there is only minimal discomfort and no downtime. An assessment of the results is made after 10 days to determine if more treatments are necessary. You’ll love the youthful, vibrant look your results will give you — and all that from a treatment that lasts just a few minutes to complete! Your skin will be fuller and smoother and that pesky line and wrinkle will no longer be visible. The beneficial ingredients of the filler will also encourage more moisture to be absorbed by your skin, giving it a plumper and more supple appearance. Lips feature an independent and sophisticated fibrous muscular structure that allows fine manipulation and extensive movement. This complex of muscles is called the orbiscularis oris and is found only around the mouth. The orbiscularis oris, also known as a sphincter muscle, allows us to form the correct expressions to form a smile and frown, to talk and laugh, as well as to eat and sip. Collagen is vital here, like skin anywhere else on the body. This building block creates the shape of our lips, forming the “Vermillion Border”, which is the outline of the lips that distinguishes them from the rest of the face. Simply run your finger over the outer edge of your lips, and you’ll feel that slightly raised edge. This is the Vermillion Border, and it is comprised primarily of collagen. The labium superioris is a row of collagen that connects the top lip to the nose. A part of the Vermillion Border, the middle of the upper lip forms the top of a slightly protruding heart (Cupid’s Bow), which fits snugly into the bottom lip, known as the labium inferioris. With this outline, your lips are most likely of a different shade than the rest of your skin, perhaps pinker, redder or even darker. As we age, collagen breaks down and production slows, which is why our lips become more wrinkled and less definable. You’ll notice that vertical lines develop (smoker’s lines), and your lips almost disappear. This is typical of the aging process, however lip augmentation with injectable fillers, most notably Juvederm®, can definitely help fix this problem. By replacing the volume that has been lost, you’ll have the lips you used to have, or have always wanted! Juvéderm® has many applications in cosmetic medicine and is perhaps best known for its use in reducing wrinkles and minimizing skin conditions like scars. It is also useful in many other ways, however, including the “plumping up” of lips. Our lips naturally lose shape as we age, the skin drawing in, thinning and drying. This causes us to look older and, because of this natural process, many of us seek to find methods for restoring the fullness of our lips through cosmetic treatments. Here’s a look at why lips lose shape and how an injectable filler like Juvéderm® can help. Why Do Lips Lose Shape? Thinning and less shapely lips are, much like wrinkles, due mostly to the natural effects of aging. And, just like how our skin begins to develop wrinkles as we get older, so too do our lips begin to lose their shape and natural fullness. To understand this, we need to look at how skin itself is made up.Our skin is composed of three layers. These are the epidermis (or outermost layer), the dermis (the middle layer) and the subcutaneous (the innermost layer). Each of these layers contain fibres called collagen and elastin that give our skin tissue the natural ability to stretch and remain plump. As we age, our dermis (the layer that is most responsible for stretching) begins to lose elastin and collagen and the skin thins, making it difficult for enough moisture to reach the epidermis. The subcutaneous layer also begins to lose natural fats with age and this takes away from plumpness, leading to epidermal sagging and the loss of lip shape and fullness. How does Juvéderm help your lips? As we age, our lips naturally begin to lose the elasticity and plumpness that we associate with youth. Above, we discussed how this occurs and the causes behind it. Juvéderm®, an injectable filler, is one of the most popular methods used by cosmetic surgeons when patients look to restore lips to a youthful, fuller appearance. After lips have begun to lose their shape, Juvéderm® is able to help restore plumpness and elasticity through the properties of its main component, hyaluronic acid. Once it has been injected, the hyaluronic acid integrates with natural tissues and enhances the fat content of a patient’s lips. Regular follow-up injections allow you to maintain plumper lips and reduce the appearance of aging. Our cheeks, just like the rest of us, are affected by age. As we get older they begin to sag, wrinkle or become hollow looking — all factors that take a major toll on our appearance. The skin of our face is the most susceptible to environmental damage and the negative effects of aging of our entire body because of its delicacy and constant exposure to the elements. All of our skin begins to lose the elastin, collagen, natural fats and ability to retain moisture that is responsible for smooth, full and firm skin in our youth as we get older and our cheeks succumb to these problems faster than the rest of us. Once these essential features of healthy skin have begun to dissipate, problems like wrinkles, lines, a general thinness and irregular tone can began to appear. Once these common signs of skin damage have affected our cheeks, our faces look older than they need to. Our cheeks begin to look hollow and become crossed with wrinkles and folds that add years to our appearance. Because the cheeks are such a prominent part of our faces, damage to them reflects greatly on the general appearance of our face. How does Juvéderm® restore cheeks? Juvéderm® works to make cheeks look younger by giving back what time and nature have taken away. The injectable filler is formulated with hyaluronic acid, a substance that stimulates the production of new fats and essential proteins. Juvéderm™ integrates with the cheek’s skin tissue on a cellular basis and reverses the damage done to our appearance over time by re-plumping them and promoting a healthier, more youthful look. The two major characteristics of aging cheeks — gauntness and wrinkling — can be resolved by Juvéderm®. Patients that undergo treatments with the filler soon begin to see volume added to the skin of the cheeks, a plumping up of the skin and a pleasant reduction to a hollow or gaunt appearance. It also works to reduce the appearance of wrinkles and fine lines to leave the face smoother and more vibrant than before. Juvéderm® patients leave their treatment with cheeks that have been restored to their proper look. By attending regular follow-up procedures and ensuring that cheeks are always kept at their best, anyone can enjoy the confidence that comes with healthy-looking skin and a more youthful energy. 1. Should I get Botox or Juvéderm? One other important factor in determining which treatment is right for you is whether your wrinkles are dynamic or static. If a wrinkle appears only with facial movement, as is the case with dynamic wrinkles, then Juvéderm may not be right for you. Botox may be more suitable. If you have both dynamic and static wrinkles, you can also consider getting both Botox and Juvéderm during your treatment. This is a comprehensive approach to facial rejuvenation and is called a liquid facelift. Botox is a neuromodulator. Here is a look at the basic facts regarding both Juvéderm® and neuromodulators. By seeing the composition of each injectable product and what they can both do for your appearance, you’ll be able to better understand their differences and unique qualities. Do you need a neuromodulator or Juvéderm®? Neuromodulators, like Botox®, offer access to a wide range of cosmetic therapeutic options. Patients can undergo anti-aging injections in order to achieve facial wrinkle reduction and face sculpting or modification. Although neuromodulator treatment is indicated for aesthetic flaws of the skin, it is actually the muscle underneath the skin that is targeted. Both Juvéderm® and neuromodulators are used in many aesthetic applications — some of them even being the same as one another. However, it’s important to know that these two products aren’t interchangeable. So, what’s the difference? The divide between the two popular treatments is mainly found in how they are made. Although both Juvederm® and neuromodulators are able to be used for some of the same purposes (wrinkles and facial contouring), their makeup is actually quite diverse. Juvéderm, as a soft tissue filler, is primarily formulated with a natural substance called hyaluronic acid, which acts to add volume to the skin. Neuromodulators, on the other hand, are based on a different substance. Neuromodulators make use of the substance in order to block certain neuromuscular transmissions, relaxing the muscles. By relaxing the muscle, the skin over it also relaxes (so no volume is added, unlike Juvéderm®). Therefore, neuromodulators are only effective for wrinkles that appear while you contract your muscles (also known as dynamic wrinkles), or facial contouring issues caused by hyperactive muscles, such as an angular and prominent jawline (caused by the masseter muscles). On the other hand, injectable fillers are effective for wrinkles that you see all the time, even when your face is at rest (otherwise known as static wrinkles), as well as facial contouring issues that require the addition of volume. Speak to your doctor to learn more about your options and to learn if Juvéderm Toronto or neuromodulators are the right choice for your needs. Both are effective and worth considering when planning a cosmetic procedure that rejuvenates your appearance. 2. How much product is in one Juvéderm syringe? Each Juvéderm dermal filler syringe contains 1ml of product. A small portion of this is lidocaine – only about .20ml. A single syringe cannot be shared between two patients because that would increase your risk of infection. 3. Which is better Juvéderm or permanent fillers? Fillers are capable of revitalizing and restoring your appearance, letting you look younger and healthier through simple and convenient procedures. There are facts that are essential to know before choosing which type of treatment is right for you, however. One of the most important of these is the difference between permanent and temporary injectable fillers. Permanent injectable fillers, as the name suggests, are designed in order to provide patients with skin improvement that lasts a lifetime. Most permanent fillers are made of active particles, suspended in collagen (like Artecoll’s polymethyl methacrylate particles) or calcium hydroxylapatite that are introduced to the layers of the skin. These particles are injected along with collagen and act as the catalyst for the body’s natural collagen production cycles. They are typically administered over a number of treatments, usually performed every few months until the patient and practitioner are satisfied with the intended results. While the idea of permanent results may sound appealing, many aesthetic physicians will advise against their use. Because permanent injectable fillers last for a very long time, their results can become problematic and difficult to reverse. If a patient is unhappy with the results of their permanent filler treatment, no non-surgical option normally exists for reversing them. The more popular option for contour and volume correction is found in temporary injectable fillers. These natural products are made with hyaluronic acid as their main component (like Restylane and Juvéderm), or poly-l-lactic acid (like Sculptura) which is absorbed by the body over a period of time following injection due to their natural, bio-compatible ingredients. After a period of many months, you may require additional injections to maintain the initial results of you treatment. Temporary injectable fillers are much more popular than permanent ones and are recommended as the right type of hyaluronic acid filler by almost every cosmetic medical practitioner and board-certified plastic surgeon. This is due to their ability to achieve results that are great for that specific time. The patient will most certainly experience changes in facial contours related to the aging process, and the temporary nature of these fillers allows the injector to adjust the results of the subsequent treatment to accommodate these changes for the most natural-looking improvement. Permanent fillers are less ideal because of the fact that they introduce an aesthetic effect that is hard to reverse. Temporary fillers provide immediate results and a natural appearance. Since they reabsorb over several months, they can be better adapted to personal preference, body changes and more. Medical research has found that the risks related to permanent fillers are more serious and severe than those related to temporary fillers. Permanent fillers are products that contain ingredients that remain in the area injected, promoting the growth of collagen by a unique formula. One example of a permanent fillers is Artecoll, which contains PMAA beads. The PMAA beads are injected in the skin where over time, your own collagen envelopes each bead thereby creating the volume desired gradually. The ideal results take a little while to appear as this process occurs. However, research has found that the frequency at which negative side effects occur from a permanent filler is far higher than those related to temporary fillers because of the introduction of a foreign material in the body, to which the patient may react negatively. While the occurrence of a risk is still rare, the development of nodules, tissue necrosis, and bacterial infections are more severe. Permanent results not always be the best thing for a patient, either. After treatment, your face continues to change structurally due to the aging process. However, any area where a permanent filler was injected will remain in its place. For example, if you get lip augmentation in your 20s you will probably want a result that harmoniously balances with the rest of your 20-year-old facial features. However, these results will remain years after treatment, and may look unnatural as you enter your latter years when volume is lost elsewhere on the face. Consequently, the only way to alter the results achieved from a permanent fillers treatment is by surgical removal. Some men and women have had excellent experiences with permanent fillers. However, if you’re considering getting treatment with this type of product, please make sure you check the credentials, experience and professional background of the medical professional you’ve chosen to perform your treatment. As a matter of fact, this advice extends to any cosmetic medical treatment you wish to undergo. The presentation regarding fillers was made at the Amercian Academy of Cosmetic Surgery’s 2011 scientific meeting. 4. What are Juvéderm side effects? There are very few side effects involved with your recovery after a Juvéderm injection. The most common issues encountered by patients are minor and clear up on their own without requiring any special treatment. Some people experience swelling, itching, slight pain or redness at the treatment site but these problems often disappear quickly. Most side effects are quite mild, localized to the injection site and can be treated with nothing other than a cold compress. By listening to your cosmetic physician regarding post-treatment advice (avoiding sun/heat, alcohol and exercise) you’re likely to recover without experiencing any side effects. Everyone recovers slightly differently but patients that have undergone a procedure before are often able to return to their schedule immediately following the treatment. Results also begin to appear before much time has passed. The treatment area should begin to show improvement almost immediately and reach its optimal point within roughly a week after the procedure has finished. Depending on the extent of your goals, touch-ups or follow-up treatments may be recommended but aren’t always necessary. Even without further sessions, results often last from six months to a year. Your results are temporary, which is a good thing.